Med sin säregna humoristiska ton berättar Mahmut Fazil Coskun om en militärkupp där precis allt går snett. Året är 1963. I Istanbul beger sig fyra högt rankade militärer till radiohuset för att offentliggöra budskapet att militären tagit makten i Turkiet. Problemet är att de inte får kontakt med sina kollegor i Ankara, som enligt planen är de som ska ta över den politiska makten. Med en osviklig känsla för ironi, musikläggning och absurda detaljer målar festivalfavoriten Coskun (Wrong Rosary GFF 2010, Yozgat Blues GFF 2014) ett stramt och koncentrerat porträtt av vad blind auktoritetstro kan leda till. Kopplingar kan dras till dagens Turkiet, men det är lika mycket en allmängiltig berättelse om människans tillkortakommanden. Mahmut Faz?l Cos?kun began filmmaking with directing documentaries in year 2000. 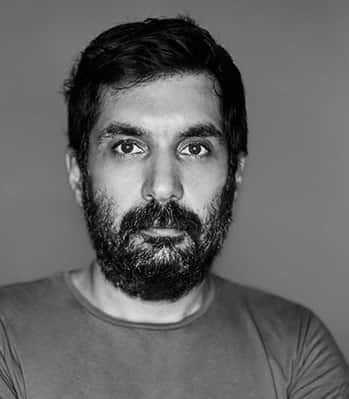 He made his first fiction film Wrong Rosary (Uzak I?htimal) in 2009, for which he won several national and international awards including Rotterdam film Festi- val’s Tiger Award and I?stanbul Film Festival’s Best Director award. ’THE ANNOUNCEMENT’’ is a story of a clash and a unity of two different parts; soldiers and civilians, who read and understand the world and the life from two different perspectives. ‘’Waiting in the east, moving in the west wins’’ they say. The chaos and tragicomedy of this statement have been visible in Turkey for years. When I came up with an idea of a film out of this story, I thought I will not be able to find a better story that I can express all these oddness and contradictions which are hard to understand at first glanze. I have never had an intention to be a side or to judge what’s been going on. Also, I am not a historian. Even though, the story of the film is familiar with some other real life stories, I wanted to write my own story and tried to see how I can see the past independently of official or unofficial history. My aim in the story is to express the absolute power of the streets and the life following the process of the announcement of a coup without being a supporter or an opponent of it. Ali Sec?kiner Al?c?, Tarhan Karago?z, Murat K?l?c?, S?encan Gu?leryu?z, Serkan Ercan, Erdem S?enocak, Sanem O?ge, Mehmet Y?lmaz Ak, Nazmi K?r?k, Mu?fit Kayacan. 2013 Yozgat Blues, Feature; 2009 Wrong Rosary, Feature.